What makes the system for artificial snow? System for artificial snow consists of water accumulation from which derives the necessary water to make artificial snow and the pipeline system through which with high-pressure water and compressed air delivered to a device for the production of artificial snow - guns and launchers. Guns, fixed or mobile, as well as launchers, are placed across full length of ski trails and ski routes, to cover 100 percent of the area intended for skiing. Artificial snow is small particles of ice that are used to increase the amount of snow available for winter sports such as skiing or snow boarding. It is produced by a machine that uses a high-pressure pump to spray a mist of water into the cold air. The water droplets subsequently crystallize to form fake snow. The first commercially successful machines were developed in the 1950s and improvements in technology have steadily been introduced. With the increase in the popularity of winter sports, the artificial snow market is expected to show significant growth. How does the system for artificial snow works? It is known that the vapor rises into the atmosphere, where the particles at a low temperature are crystallized, and the water vapor so formed natural snow. The system for artificial snow simulates such a natural phenomenon. Water is pumped from the lake, the pipeline is delivered to a device for the production of artificial snow, from which with high pressure is sprayed in the air and at low temperature these tiny droplets crystallize and form snowflakes. For the production of artificial snow is used exclusively raw, unprocessed, plain water without chemical additives, in order not to endanger the natural environment of the mountain, as well as the health of users. What are the requirements for the production of artificial snow? To make artificial snow it requires certain meteorological conditions. The air temperature must be -3ºC wet-bulb temperature, or lower. Wet bulb temperature is a way of measuring air temperature, which takes into account the effect of air humidity on the temperature of the ambient air by reducing the relative humidity, lowers the temperature of the surrounding air. In the present case, for the production of artificial snow drier air is better suited, so that the water rapidly crystallizes and the process of making artificial snow is faster. Also, greater distance from the ground is suitable and for more crystallization time, so that is why snow guns and launchers are directed from the ground upwards. When system for artificial snow operates? 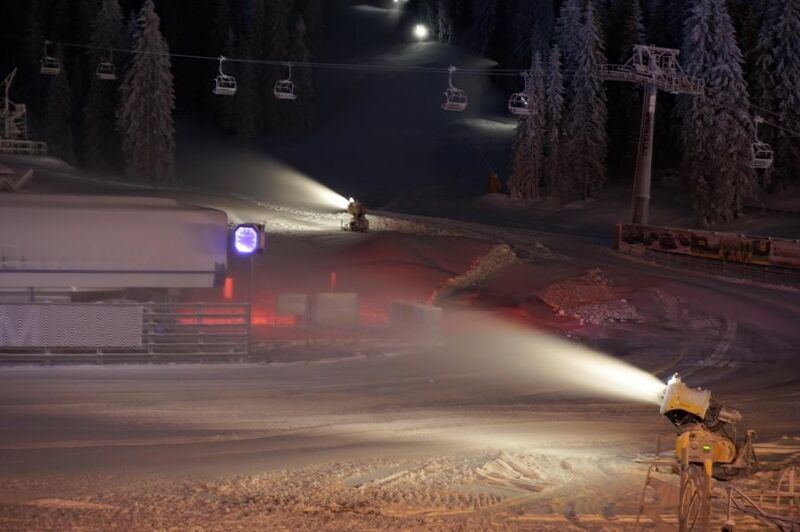 Artificial snowing system works mostly at night. The tracks are prepared then during the night, in the morning tracks are always ready and safe for ski lovers. If necessary, the system may operate during the day and then the devices are directed so they won’t interfere with the skier. The minimum height of the snow needed for snow machines would be able to prepare ski resort is 35-40 cm, during which the snow is compressed to a thickness of about 15 cm. 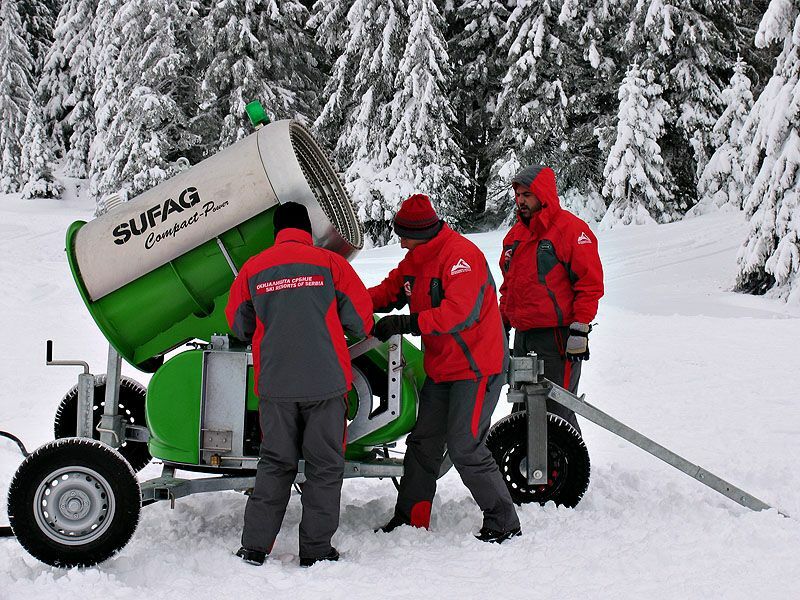 Artificial snowing system does not work simultaneously on the entire surface of the ski resorts, but the artificial snow making is done by sections.